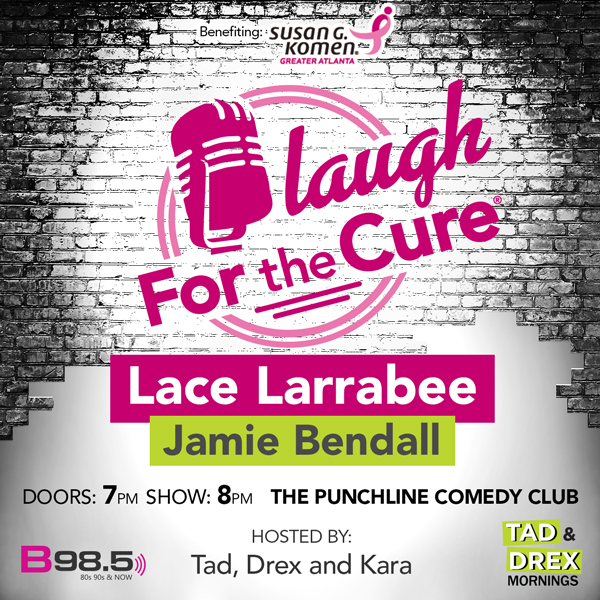 Join Komen Atlanta for our 1st Annual Laugh for the Cure event, presented by B98.5 and The Punchline! Komen Atlanta’s Laugh for the Cure is an event that will generate hundreds of laughs and thousands of dollars to invest in breakthrough research and community programs to enable women in Atlanta to detect and survive breast cancer. In partnership with B98.5 and The Punchline, the evening will showcase top comedians and a raffle with great prizes. And that’s not all…the night will be hosted by B98.5’s own Tad, Drex and Kara! Join us for this fun-filled evening, where laughter and commitment to an important cause will both take center stage. $12.50 from each ticket purchase will be donated to Komen Atlanta. A sell-out show will allow Komen ATL to provide 24 mammograms to people in need in metro Atlanta, so we need your help filling the room! Invite everyone you know to join you for this family-friendly evening of fun and laughter to benefit Komen Atlanta. Your ticket is your entry to the event, food and beverage purchases are extra. Raffle tickets will be available for purchase at the show at a cost of $5 for 1 ticket or $25 for 6 tickets. Jamie is co-owner of the Punchline and performed at his first open mic in the fall of 1991. Lace is an Atlanta-based actor and nationally touring stand-up comedian who can be seen at clubs from coast to coast. Festival credits include; the Laughing Skull Comedy Festival (2017 semi-finalist), the She Devil Comedy Festival, the Laugh Your Asheville Off Comedy Festival and the She Dot Festival in Toronto. From stage to screen, Lace’s comedy has been featured on Viceland’s Flophouse and she is a FOX network favorite with several appearances on their tv shows; Laughs, Dish Nation and Punchline, all available on Hulu and/or YouTube. You can also see Lace on brand new episodes of The Weather Channel’s Weather Gone Viral this fall and on Facebook Watch’s newest scripted dark comedy, Queen America, to be released in early 2019.